One of my favorite tricks in Power BI is to use R integration to quickly export data outside of Power BI. This is also a very popular question among Power BI enthusiasts. Once users realize the true capabilities and easy of the Power Query editor to transform and clean data they want to clean up their files using Power BI but the challenge is then how do I get the data out? Update: Video embedded at bottom of blog post. Like all of my quick tip blogs, this will be quick . You will export data from the Power Query Editor. To launch the Power Query Editor click Edit Queries from the Home ribbon in Power BI. 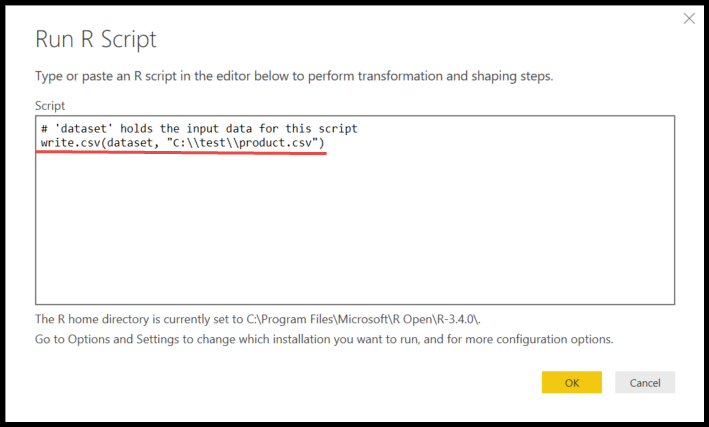 Inside the Power Query Editor, click the transform ribbon and then click on R.
That’s it! Click ok and check your folder for the file. Do notice that I used two backslash characters, this is required. The other question I get is can I write the results to an excel file or to a SQL Database table and the answer is…. Yes! R has packages that make doing particular tasks easier and if you want to write to an Excel file or SQL Server table you would need to install those packages. My hope is to do some follow-up post around this topic.